Deep Thought Pub: Book Review: Pub Theology, a Provocative Brew! 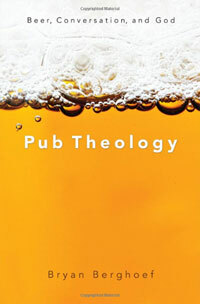 Book Review: Pub Theology, a Provocative Brew! Bryan Berghoef is an author after my own heart. He loves beer… and Jesus. But not the Jesus we typically find in our traditional institutional church structures, where brutal honesty is squelched, members are spoon fed answers, and the goal is to produce clones who all believe one body of doctrine but don’t think for themselves. No, Bryan’s Christ is humble (open to listen to other perspectives, embraces religious diversity, and makes love, mutual respect, and communal exploration paramount) and his beer is good. It creates the scene for this story—the local pub—one of the best places where a faith (and no-faith) community can learn a whole new paradigm for Christ-like fellowship. And that’s what you’ll do if you read Pub Theology. You’ll learn and experience the pub-theology way. Not only how Berghoef, a pastor of a church in Michigan, begins a regular meet up at a brewpub to discuss theology, philosophy, and the meaning of life, but how it attracts an eclectic variety of wayfarers—from conservatives to progressives to agnostics—who experience a challenging and encouraging environment to both deconstruct and discover their faith, or just learn from another—even, or especially, from an atheist, one of the long-time attendees. Which is why you’ll also discover a safe haven, where condescending religious authority is discouraged and the most doubting are welcomed with open arms, and some damn good microbrews. In telling his story, Berghoef meets head on some of the most controversial faith issues of our day that sorely need addressing. Not only how to rethink church and outreach, but for instance, how to rethink the Bible, still taking it seriously, but being honest about its sometimes contradictory nature and how we need an understanding of its history and culture to discern its message for us today. Moreover, including exploring more inclusive themes for God, questioning faith that is motivated by a fear of hell or God’s punishment, and understanding the sporadic ways the early church developed cherished doctrines, such as the Trinity or the divinity of Christ. In the end, Berghoef deals with some of the objections people have about interfaith dialogue in a reasoned, respectful way that acknowledges the need for a safety net: the discussions don’t lead to leaving one’s faith but to knowing God’s heart for people. Pub Theology is a fascinating open-minded spiritual journey that will stretch your faith or non-faith and show you an innovative, alternative model for human interaction on theology and the great questions of life. I highly recommend it. Enjoy Berghoef’s journey, but please note: it’s more appreciated when read with a glass of your favorite craft beer! Good discussion, Monax. Thanks for sharing. sorry, Michael Camp, for the name confusion. .
No worries, Monax. Happens to the best of us.